Visit god with Goku for only 4.99! In Dragon Ball Culture Volume 6 our hero Goku ascends to heaven, trains with God, and battles the reincarnated Demon King! Discover the amazing truth behind your favorite characters, with surprising mysteries and reveals, as we conclude our cultural tour of the original Dragon Ball manga. When Goku reaches heaven he is greeted by a strange-looking man named Misuta Popo. In this volume his ancient cultural origin will be revealed! From there we’ll explore Kami and Pikkoro’s roots in Japanese Shinto and Chinese Buddhism. Afterward, we’ll fight in the thrilling 23rd Tenkaichi Budokai! But will Goku be strong enough to persevere against a green-skinned foe who calls himself “Ma Junia”?! It’s an all-out battle of gods and demons, and Goku’s the only one who can save us!! Volume 6 explores Chapters 162 to 194 of the Dragon Ball manga. It’s time to face God! How does Buddhism, demonology, reincarnation, Shinto, and ancient concepts of spiritual transcendence combine together to create the world’s greatest anime and manga? 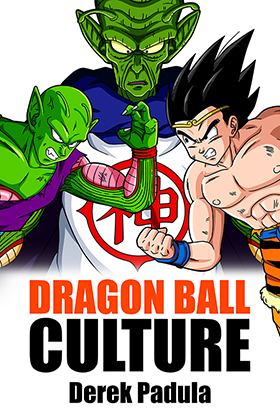 Join me in Dragon Ball Culture Volume 6, as we explore Chapters 162 to 194 of the Dragon Ball manga and find out! Let’s grab our nyoi-bo and climb to heaven!